KillRockStar BigDog Entertainment recently announced the return Australian voyage for Armada's international event brand - Armada Night. Over the years, the Armada Nights have managed to attract thousands of dance music lovers to various locations across the globe, gaining a steady fan-base, with the real Armada sound hitting a variety of Amsterdam clubs and spreading the word as far as Miami, Poland, Russia, Ibiza and more. 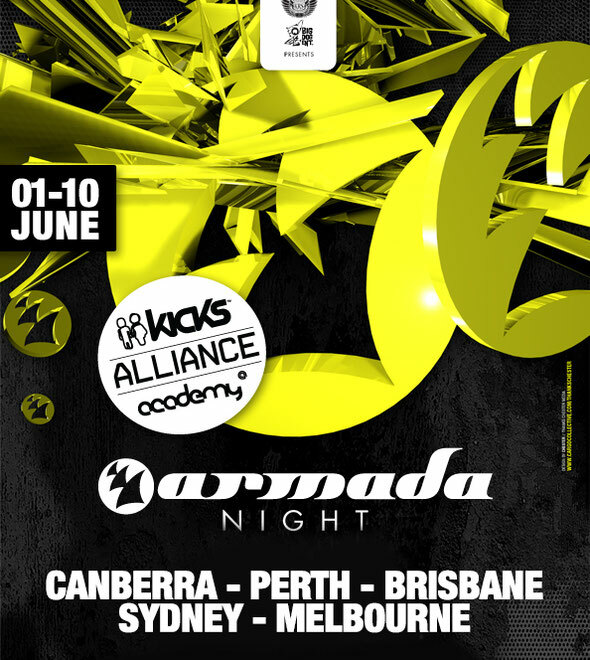 After the success of last year, Armada Night is coming back to Australia in June 2012 with Australia’s very own and world #48 DJ tyDi, who will be gracing the five show tour alongside the duo which headlined Australia’s biggest dance festival, Stereosonic – Myon & Shane 54. KRBDE have also added Tenishia and Alex M.O.R.P.H. to the series of shows. June 9th – Sydney (Hi Fi): tyDi+ Myon & Shane 54 + Tenishia + Alex M.O.R.P.H. June 10th – Melbourne (Trak Nightclub): tyDi+ Myon & Shane 54 + Tenishia + Alex M.O.R.P.H. For more info, check www.armadamusic.com or www.krbde.com.